SWAN-CAM! 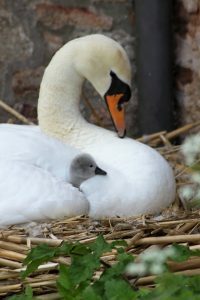 The Bishop’s Palace & Gardensin Wells, has announced that Wynn, the female mute swan who recently lost her long-term mate Bryn, has hatched a clutch of cygnets. It is thought there are now five cygnets, with a further egg still to hatch. Swan fans have been glued to ‘Swan Cam’, the Palace’s 24-hour, infra-red camera which is trained on the nest, in the hope of being amongst the first to see the new cygnets. Viewers from around the globe have been sending their good wishes to the Palace and to Wynn, who was widowed back in mid-April when her partner Bryn passed away due to old age. Wynn had already laid six eggs and was sitting on the nest by this stage. The first two cygnets will be named Meghan and Harry whilst the annual cygnet naming competition to name the rest of the cygnets, will be held as usual by the Palace over the next few weeks. Entries are invited by email, social media or in person at the Palace Shop and the deadline is Thursday 24th May at 12pm. Swan Cam can be viewed on the Palace’s website, www.bishopspalace.org.uk.